I’m aware that waste management is not the sexiest topic around (that’s what I call a Cillit Bang opening sentence – BANG! And half your readership’s gone). I doubt anyone but the local party hacks even read my mild criticisms of Greenwich moving to a weekly bin collection. But like it or not, with decreasing levels of landfill available, and tougher central government recycling targets, this is going to remain a political hot potato for some time to come. And as there seems to be a bit of a market out there for blog posts with graphs, here’s a blog post with graphs. About rubbish. In London. The Animal tries not to be too parochial around here, but occasionally something comes up locally that illustrates a broader issue. So it was last week, when the London Borough of Greenwich put a leaflet through the door outlining amended waste collection arrangements. I don’t tend to be overly critical of Greenwich Council, partially because that seems to be a bit of a crowded market online, partially because it is run by my Party, but mainly because from The Animal’s point of view there is little enough to complain about. Certainly, Greenwich isn’t the most exciting, or go-ahead local authority on the face of the planet, but it does seem to trundle along happily enough on a day-to-day basis, delivering key services competently enough most of the time. A confession: when the Animal wrote to the Mayor a couple of weeks ago, I didn’t really expect to get £3.11 back as a mark of appreciation for getting into work on ‘snowday’. I also didn’t really expect a letter from the Mayor: I’ve worked in the Mayor’s office and I doubt this administration gets significantly less correspondence than its predecessor. But I did think I might get a response to the political point I was trying to make about Johnson’s decisions on that day. No such luck. Above: The front page of the Animal’s local train operator’s website, as of 11am this morning. I’m awfullygrateful for advance warning of what looks like rather severe disruption to some unspecified services on an as yet undecided Thursday in May, but I was hoping for some information on whether I’d be able to get home from work this evening. 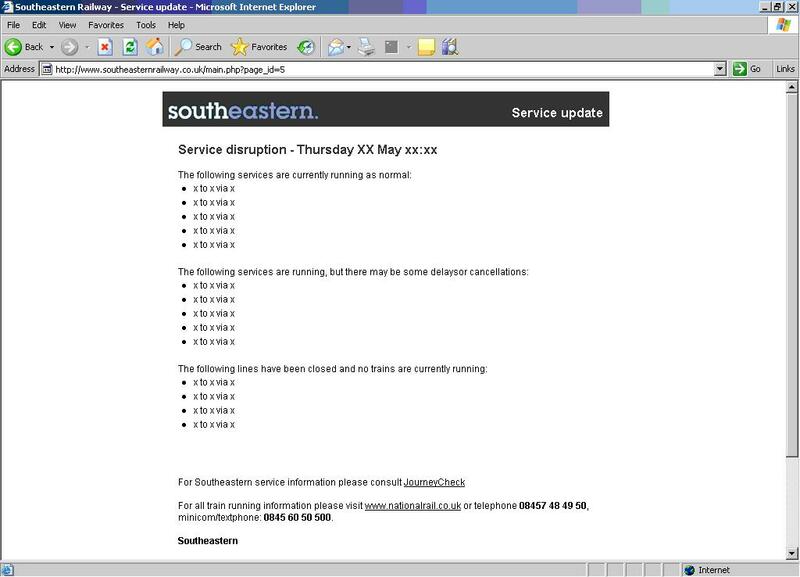 Southeastern’s website has somehow managed to be even less useful than the information on the electronic displays at Westcombe Park station, which simply read ‘Due to severe weather conditions, we are unable to provide you with any information at this time’. Now, I realise that this is once-in-a-decade weather down here in the balmy south east and the trains and buses are going to cease up. It just isn’t worth paying for the infrastructure resilience that will stand up to the severe conditions experience on one day in about 4,000. But I can’t quite understand how snow prevents electronic information systems from functioning correctly. Anyway, the short answer is that South Eastern weren’t managing to run any trains into London today, but finding that out was a process of guess work from the undisturbed snow on the railway lines themselves. Still, the walk through the ecology park to North Greenwich station for the skeletal Jubilee line service was very scenic.